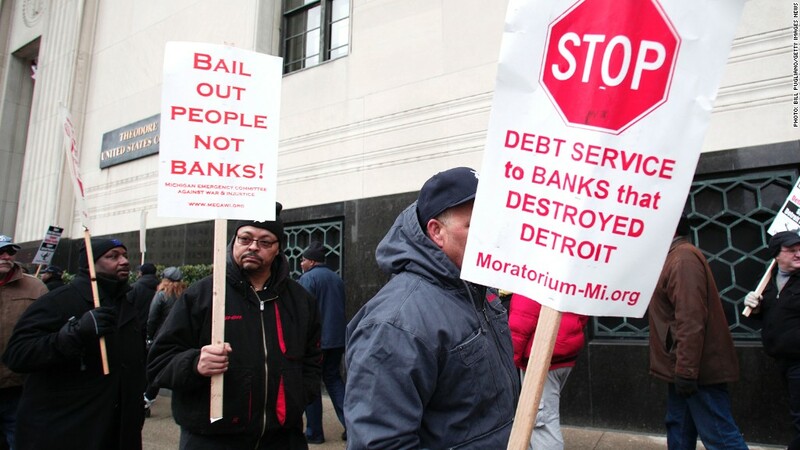 Demonstrators have gathered outside the federal courthouse where hearings on Detroit's bankruptcy have been held. Detroit has struck an arrangement with two major banks that would give the city access to much-needed casino tax money. The proposed $85 million deal is about half a $165 million proposal rejected in January by the federal judge overseeing the city's bankruptcy. It would settle casino tax revenue claims from Bank of America (BAC) and UBS (UBS). Struggling with pension debt, the city in 2009 pledged a portion of future revenues in exchange for a $300 million payment. Under the deal, the banks will also support the cash-strapped city's debt adjustment plan, Detroit emergency manager Kevyn Orr said. The settlement frees up "critical funds that we can invest to improve the quality of life in Detroit." Orr said. Judge Steven Rhodes would have to approve Monday's deal. His January rejection of the $165 million settlement said it would likely not be allowed to stand under the city's bankruptcy reorganization plans. The January decision was applauded by unions, because it put the big banks in line with current employees, retirees and other city creditors.